Back in November, I ordered the Bare Escentuals Bare Luxury TSV from QVC - and because I'm a glutton, I signed up for auto-delivery so I'd get 3 additional kits in the future. Today, my best friend the UPS man showed up with the second shipment and I have to say, I think I like this kit a little better than the first. 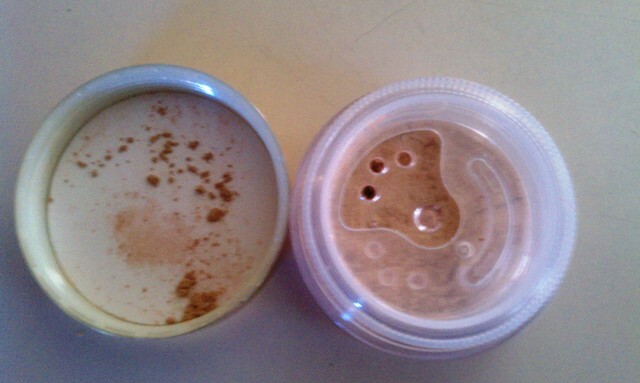 Of course, I've only swatched and played around with the product so far, so I reserve the right to change my mind. While both kits contain the same products, the colors are different and this second shipment just seems perfect for spring. 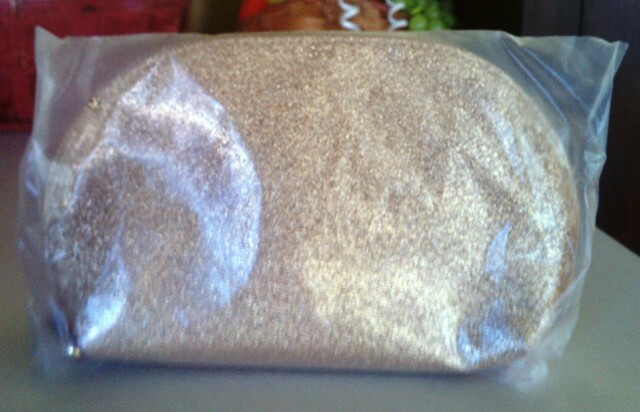 Just as with the first, the second shipment comes with a gold, glittery makeup bag. 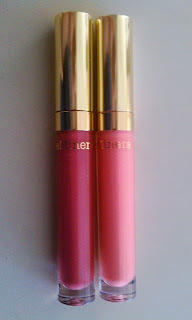 While it's a decent size and cute enough, I'm not really a fan of gold so I'll probably pass this along to a friend. In fact, I haven't even bothered to take it out of the plastic. 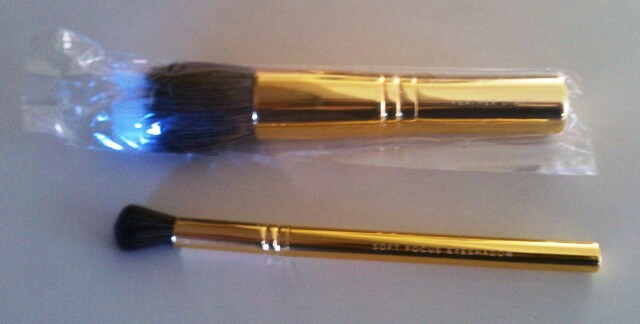 There are also two brushes included: the soft focus eyeshadow brush and the feather light brush. I already have a feather light brush, which is essentially Bare Escentuals' version of a duo-fiber brush, so I'll probably pass that on or save it for a giveaway as well. The soft focus eyeshadow brush looks likes a nice blending brush, and because it has a shorter handle, I think it'll be a great brush for traveling (I'm going away for Easter this weekend, so perhaps I'll road test it then). 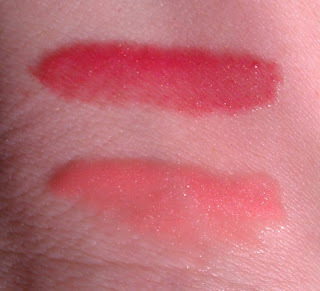 The kit also contains two of the newer Moxie lip glosses. I've mentioned these before - I like the formula quite a bit, though I know some folks have issues with the scent. 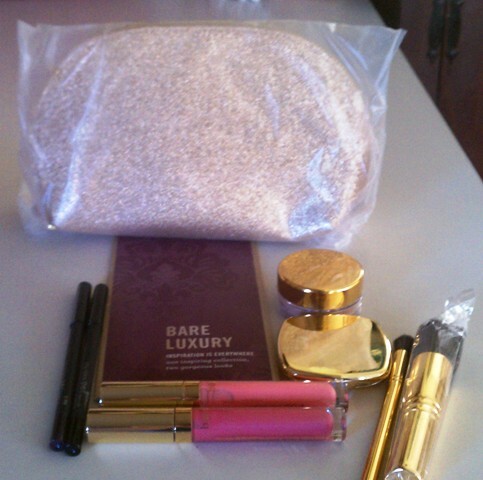 The shades included in the second Bare Luxury kit are Show Off, a light peach, and Live Wire, a plumy rose. While I have peach lip product fanatic, I think Live Wire is my favorite of the two - it fits the spring trend of brighter lip colors, but it's muted enough that I don't feel self-conscious in it. 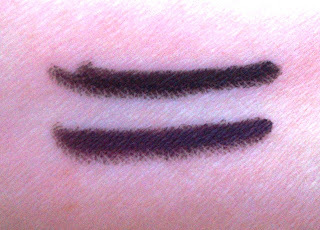 There are also two eye of the Round the Clock Waterproof eyeliners in the kit - Midnight, a standard black, and 5 PM, a dark plum. The swatches may look similar (Sorry about the poor lighting! Damn sun had already started to move when I snapped the photos), but 5 PM is definitely a purple shade. 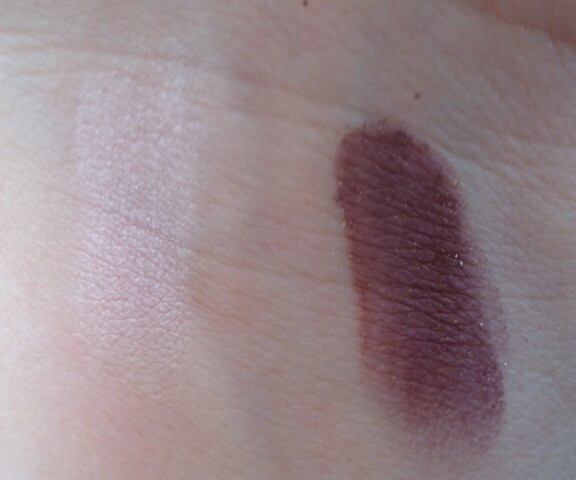 I like how dark it is, though, because it won't scream plum on the eye but is still much softer than black. I like these liners quite bit - they definitely stay in place, though I don't often wear liner on my waterline so I can't attest to their staying power there. The last product in the kit is the Secret Radiance All-Over Face Color. 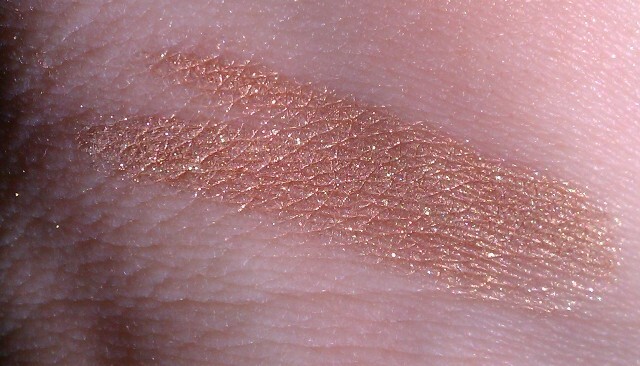 It's a gorgeous, glowy gold shade that seems like it will work well as a highlighter. 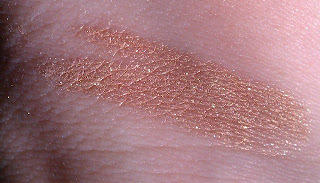 Now, when you look at the swatch, it may seem really glittery and over the top, but when blended into the skin, it's very pretty. I think it would be especially pretty on tan skin because of the golden undertones. 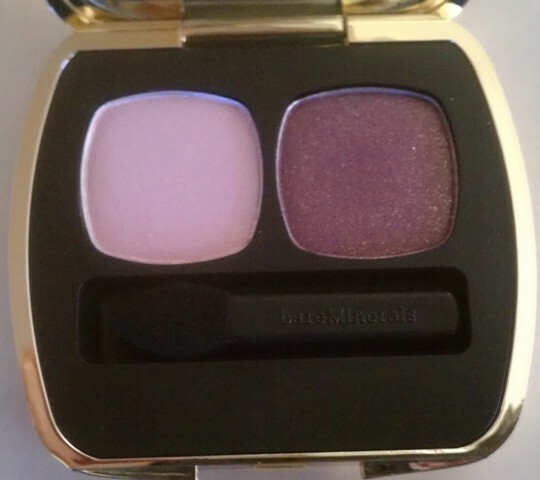 Have you tried any of these Bare Escentuals products? Are you a fan of the Ready line? What are your favorite colors for spring? Oh dear... now I think I'm going to have to release mine. The glosses look great! One looks almost like the peach from the first kit (I forget the name of that one). I liked the rose gold radiance in the first and I think this one is also gorgeous. ut oh... I really thought I might pass on this one but NO. Thanks for your swatches (I think) LOL.